There’s a lot going on today and I have to admit it’s all put a spring in my step! I love being busy because it makes the days much more enjoyable and I tend to actually get more done. Seems when I have time on my hands I just sit around and waste it. Anyway, I’ve got the second installment of my Fall front porch. I already shared my DIY Fall Grapevine Wreath. Today I’m here with easy Fall Mums in Olive Buckets. What you need: Olive bucket (or other container,) pot for inside, grapevine wreath, greenery, bunches of berries, mum in a pot. Place any sort of pot inside the olive bucket upside down. I used 8 inch terra cotta pots I had in the garage. This will act as a riser to lift the mum over the edge of the olive bucket. Place a gravevine wreath just inside the rim of the olive bucket. I totally lucked out with the size of my wreaths. I used 15 inch wreaths and they fit perfectly inside the olive buckets. It would be just fine for the wreath to sit on top of your container too. It doesn’t have to fit inside. Place your potted mum inside the olive bucket. Stick your greenery and berry bunches into the grapevine wreath. You don’t have to own olive buckets to use this method. It would work with any sort of large pot. 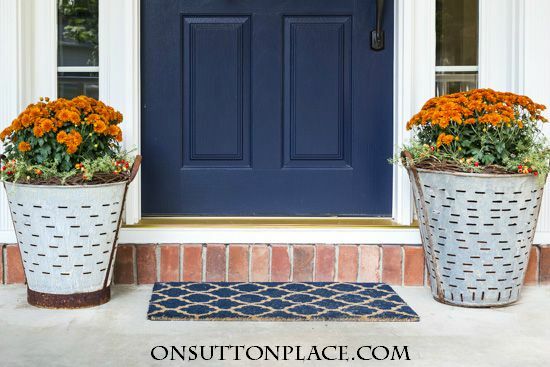 I think it would look amazing with terra cotta pots because they are the perfect Fall color and are very budget-friendly. Very pretty, as usual, Ann. You take the everyday and make it awesome! Great idea, Anne! I put your idea to work and made two pots! Since I don’t have the lovely olive buckets, I used what pots I already had. And you inspired me to make my own grapevine wreaths from the many wild grape vines that grow in my backyard. Love the look!!! Anne, So pretty! I love the olive buckets. I love the olive buckets, Anne! I don’t think I have ever seen them. I love your front door updates, thanks for the ideas. Wow… those olive buckets are amazing Ann. I love how you have dressed then up for the season with the mums, The wreaths are a genius idea too and I look forward to trying that myself. Ann these olive baskets are wonderfull! 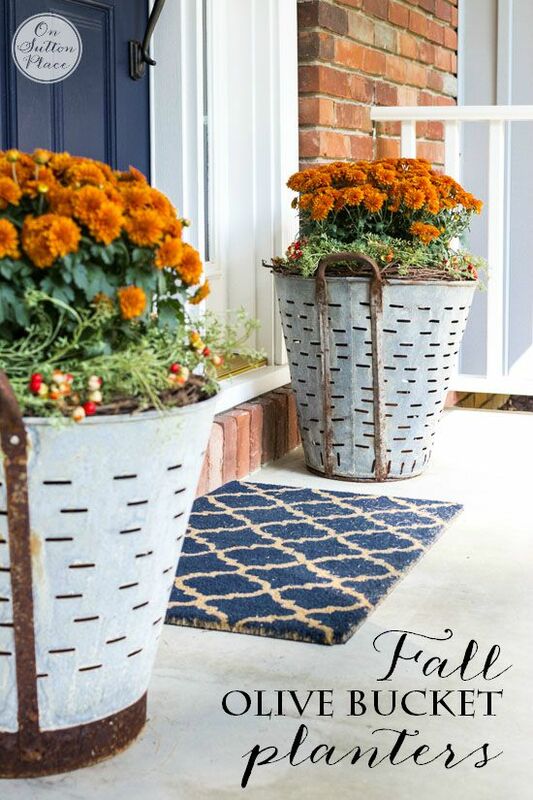 What a great way to welcome guests and decorate for Fall. I loved your idea of using the olive buckets plus using the wreaths as fillers. 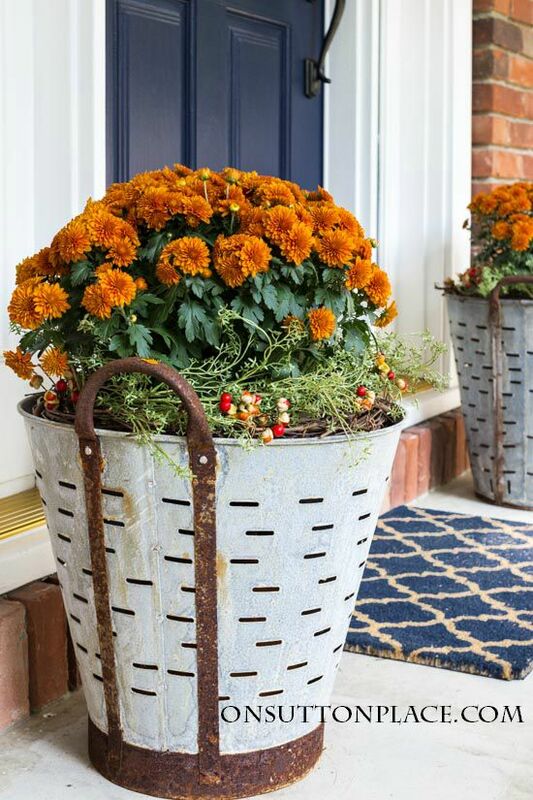 I only have one olive bucket…so I used my plastic urn type planters from summer and sprayed them bronze….used two wreaths, beautiful yellow mums..and this DIY turned out beautiful! Ann, the mums in the olive buckets are beautiful! I’ve never thought of adding the “embellishments” to them….definitely going to do that to dress them up a bit more! Your porch is gorgeous! The weather is chilly and its a perfect time to set out mums on the front porch! Love this idea!!! Love this simple project Ann and thanks for your hard work in helping with the party! Very lovely – everything looks wonderful. Thanks for sharing…. Love how you styled your French olive buckets Ann! And I love the fact they don’t match. Beautiful fall entrance! How smart to add the grapevine wreaths! Love your olive buckets! Love it! Using the grapevine wreaths – genius! Thanks for the inspiration! Thank you for inspiring us. It is always a treat to get your email. Thank you for sharing your time and talents with us. never would have thought to put the grapevine inside the bucket to cover the gap. thanks for the tip! Ann, you have the best ideas my friend!!! LOVE putting the grapevine wreath on top of the olive basket to fill in the gap! Sharing an pinning! On several occasions I have needed a little extra something to dress up a plant or pot, but never thought to use a grapevine wreath. Very nice touch. Your porch looks great. Love the orange & blue. I love this idea with the berries. I have to find some olive buckets…thanks for the links! 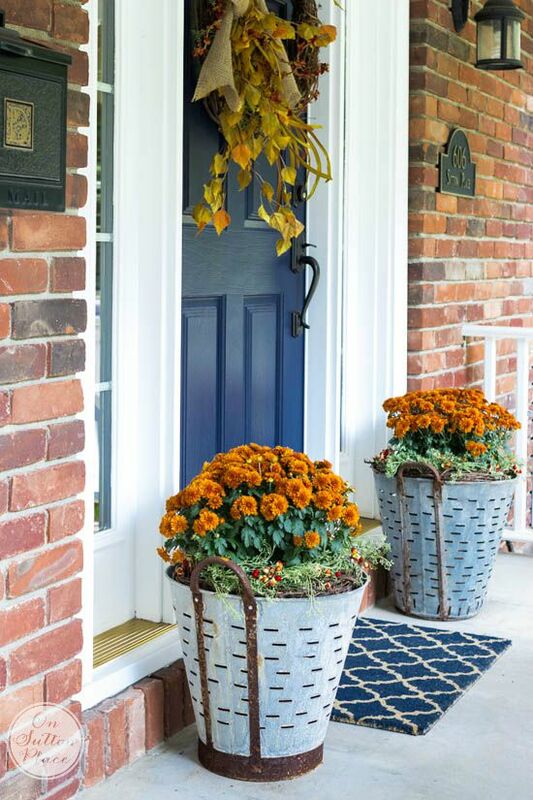 I agree that the terra cotta pots would also be a great way to display the mums, love the grapevine wreath idea that really adds that extra touch. Going shopping for some more mums was my main objective today, I love the burnt burgundy color but we were put under evacuation advisory because of the Butte Fire so packing to leave became #1 priority. Love the look. The grape vine wreaths are a great addition. Love the olive buckets. This looks great with the coloring of your door and home. 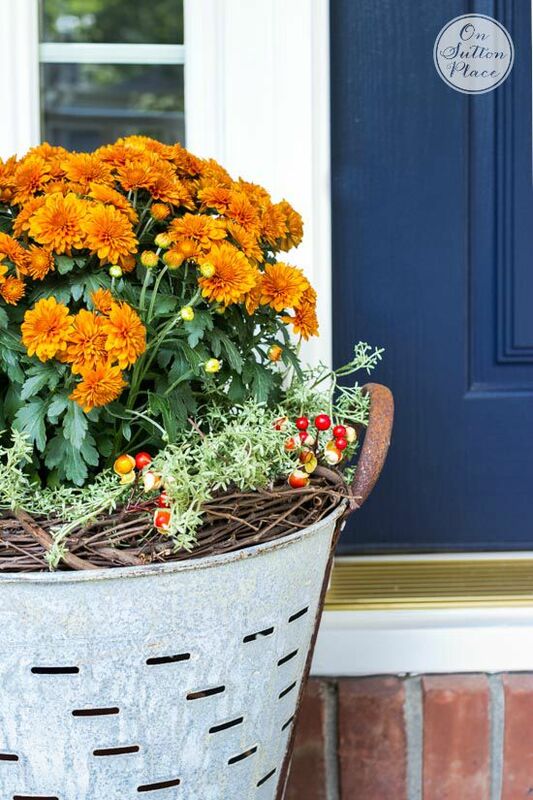 Love the orange mums with your blue front door, it looks fantastic. i like the way you dressed them up & as usual your photography is beautiful! Thank you so much for getting your blog back for me a couple of weeks ago, I am glad to be back and enjoying it! Oh they look so beautiful Ann!! 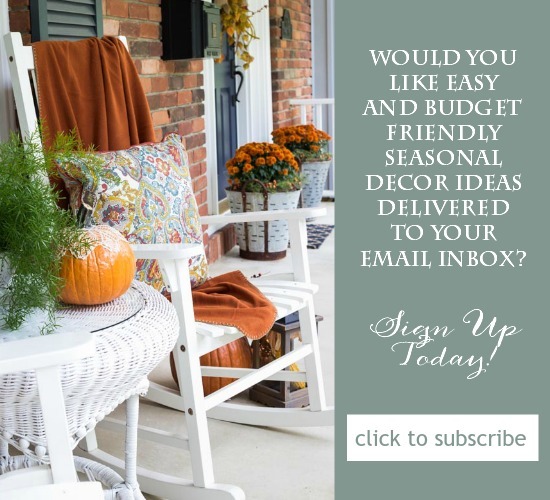 Your front porch has always been one of my most favorite in blogland and how you’ve dressed it up for fall does not disappoint. So fun to be part of this event with you my friend! Wow that looks fantastic Ann and I wouldn’t have noticed the grapevine wreath until you pointed it out….brilliant idea by the way. Love the orange mums against the blue door. I so love olive baskets. It brings me back to the years of ’76-79. My in laws owned a country store in the middle of nowhere where an oil company also owned huge farming as well as huge family farms around. Crops were mostly cotton but the huge oil company had a lot of olives. The crews came from an hour away so they often stopped to get food for their drive home. Picking was done by hand then. Now I know they used buckets but I don’t know if they looked like this. But look at an olive. Think how quick and nimble their fingers flew amongst the branches as they teetered on ladders to fill just one of those baskets. They had to fill many. Their contractor was paid and then paid them by how many buckets they’d picked. It was hot. Now it’s all done by machine. I noticed the oranges, lemons and olives are replaced by pistachios. They used to be handpicked but now are oh so carefully picked by an engineered machinery to do just that. So I look at the olive buckets and think back on those crews that came from the area where most olives were grown. I finally got faux this year and I certainly am glad I read your post how to utilize them for mums!! Thank you!!! This same time period a local farmer was showing men from Israel our farming methods for the Southern San Joaquin Valley is quite similar to Israel’s soil and climate. Just wish we’d stayed up with them and had desalination plants in place for drought years. Love your mums in those olive buckets,they really are colorful with the front door and door mat. Simple things can make all the difference,lovely Ann. Love the looks of the mums in the olive buckets! Ann I always love your porch post! The mums look great in the olive buckets and that color of mum is stunning with your navy door!! Another GREAT job, Happy Fall to YOU! I love the olive bucket/mum combo. Your entry is so pretty! I wasn’t going to put out mums this year, but I might seriously steal your idea. Love it, Ann! 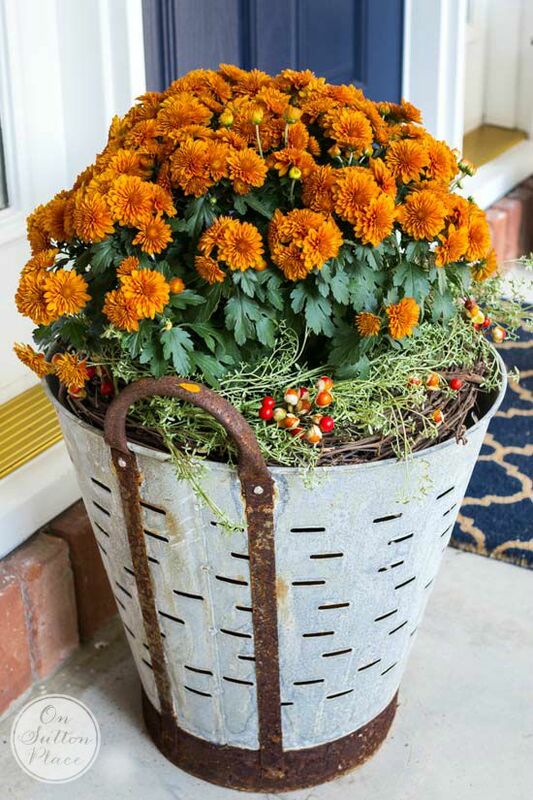 Love your olive buckets filled with beautiful mums. The pots inside as risers is a great idea. I have seven built-in planter boxes on my front deck. I will definitely use the wreath and mum idea in them for a fresh new look to my deck. Thank you. 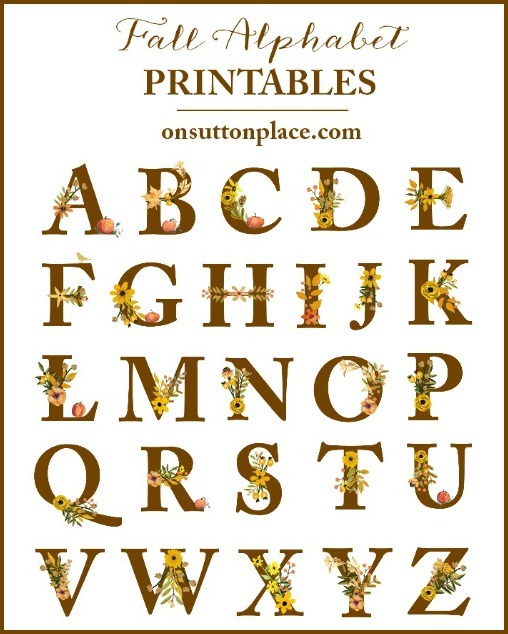 Such an easy yet great way to show off the fall colors… Love it! Thanks for the giveaway chance. I love those olive buckets. The mums look gorgeous in them. How clever of you to add the grapevine wreaths to frame them. You have such good ideas. 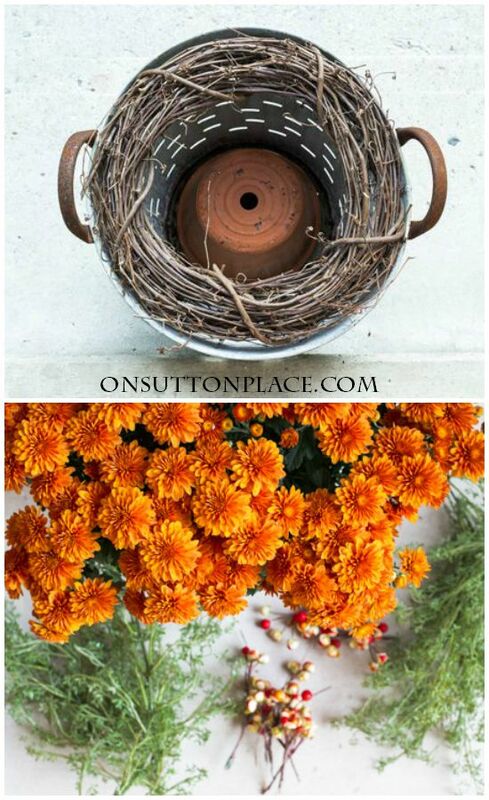 Ann, the mums are perfect in the olive buckets!…I so love how you added the grapevine wreaths at the base of the mums. A very special and creative touch….Have a great weekend Ann! Ann-I am an olive freak. I eat olives everyday. Like 10-12 olives, not kidding. I seriously need some olive buckets!! Thanks for all of your hard work to bring us together on bHome! I was disappointed when I missed out on these olive buckets when they were offered at Decor Steals, and now seeing how beautifully you styled them makes me even more sad that I missed the deal. You have created a welcoming entrance to your home Ann. Your posts always make me smile. Hi Dorene! Did you check out the links I included to other olive buckets? Some are a bit pricey but others are not. Take a look! I love those Olive buckets Ann! They are perfect by your door. Nice mums too. I have to go get some next week.